I am a single mother that is short on time. When I cook, I have to make it count for more than one meal. Time is my most precious commodity at the moment, so cooking bigger sure helps in a time crunch. If I have a little wiggle room during the weekend to cook, I try to fill the fridge for the upcoming week. Okay, it’s no secret that I love leftovers. They can be easy to eat as is for a second meal, or used as inspiration for a new dish. I use my leftovers both ways. If I cook a couple of extra pieces of chicken, that goes either in school lunches or to work with me for a second meal. Using that chicken as inspiration for another meal might mean a nice chicken casserole or chicken salad sandwich. Need some ideas? Let me outline my leftovers from the past few days. Night #1. Leftover: Quinoa. Used the next morning as an addition to breakfast oatmeal. Quinoa powered up morning oatmeal following an 8 mile bike ride. It was a solid “recovery” breakfast. 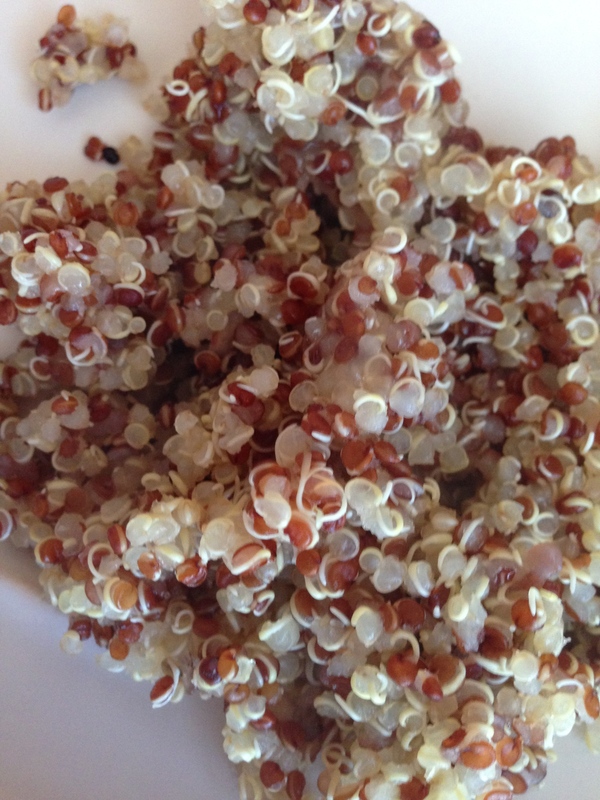 Leftover quinoa added a nice nutritionally punch to morning oatmeal. Night #2. Leftover: Goat cheese. 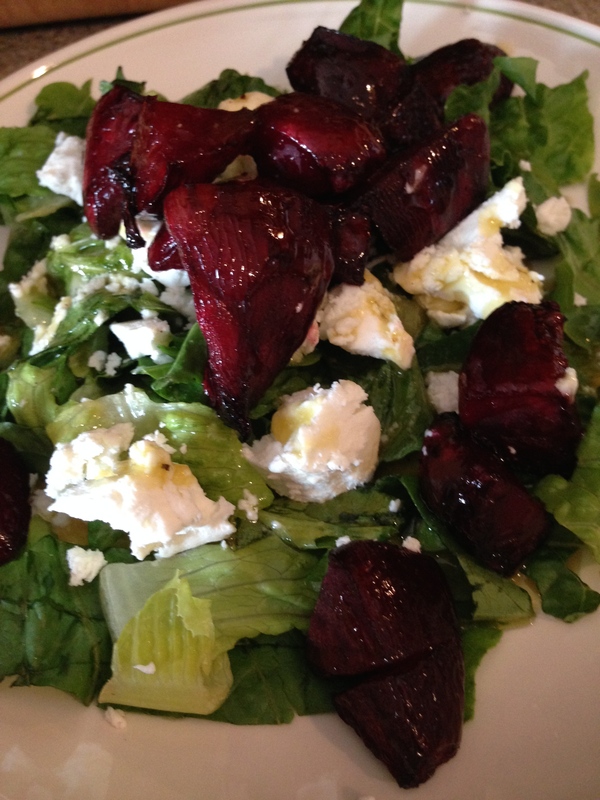 It was leftover from a beet salad. My high schooler used it to spread on his “gourmet” sandwich, adding delicious creamy flavor to a weekday lunch. Leftover goat cheese not used for this salad added flavor to a sandwich. Night #3. 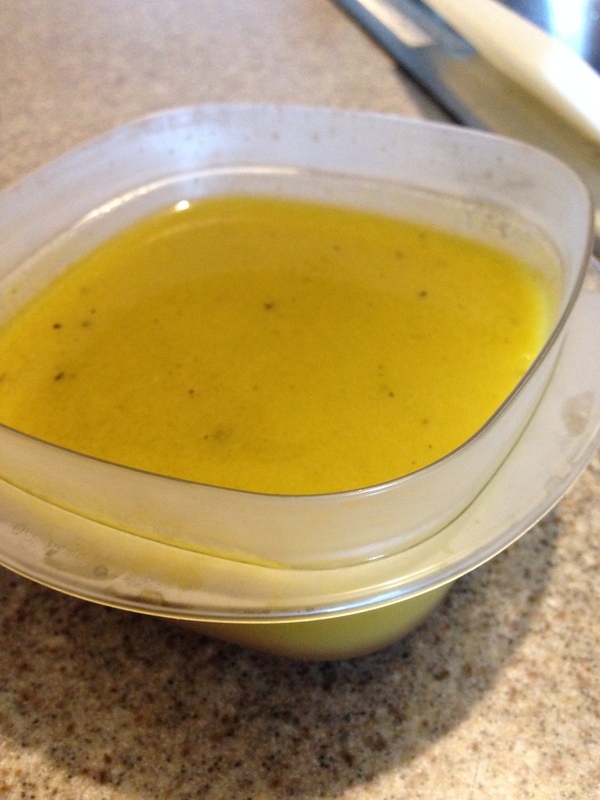 Leftover: Home made vinaigrette. I used this drizzled over roasted veggies going into the oven. Homemade vinaigrette is super easy to customize ingredients and flavors to make even picky eaters happy. Leftover vinaigrette. This isn’t just salad dressing. It has a zillion uses. Night #4. 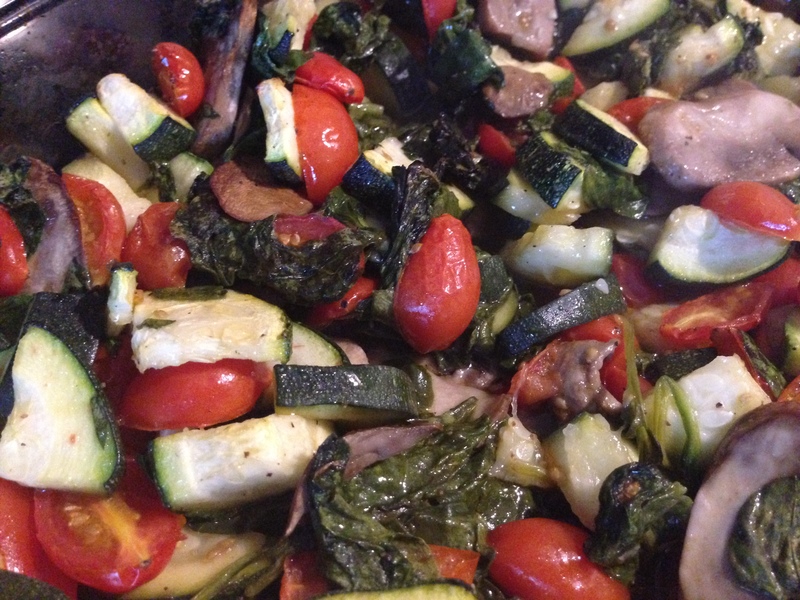 Leftover: Roasted veggies. These leftover roasted veggies made the most amazing sandwich to take to work. I wish I also had some of that leftover goat cheese too, but it was quite tasty as is. Roasted veggies made an awesome sandwich, panini style! Night #5. Leftover: Pesto, shredded chicken. (Nonleftover freezer item: frozen cauliflower). I actually pulled this from the freezer to make a quick pasta dinner. Dinner was ready in the time it took for a pot of water to boil and pasta to cook. The cauliflower was microwaved. Everything was tossed together for a quick and easy one dish dinner for a busy night. By now I am sure you get the picture. Be creative. When cooking, cook a larger portion than you need. Toss leftovers in both the fridge and the freezer. And start embracing the ease of the next meal using leftovers. Let me know what you make with your leftovers! 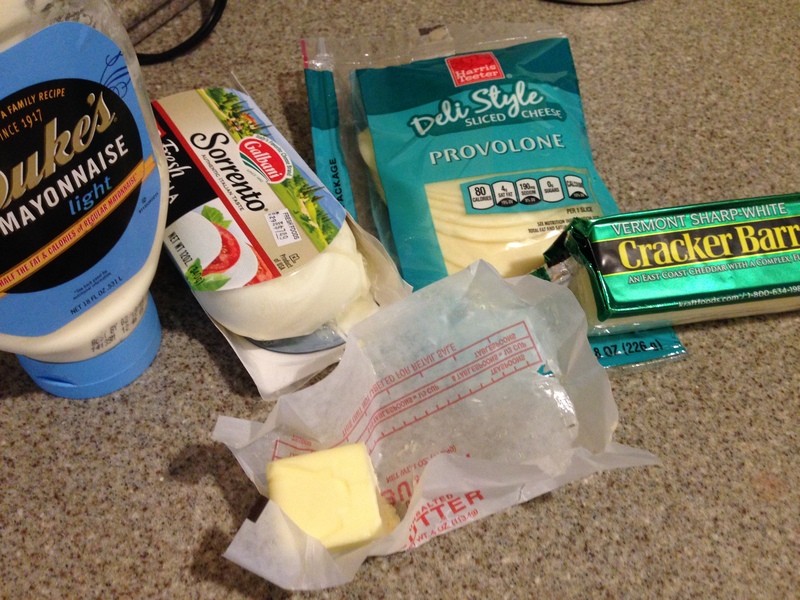 My last post outlined the challenge of making a quick dinner with items out of my fridge and pantry. I was too tired to fuss, and ended up with a big batch of tomato roasted red pepper soup. It was belly warming and delicious. After dinner I tossed the leftover soup into the fridge. That was a lucky move! This became dinner. I put a big pot of water on to boil. Next, I took the leftover soup, put it in a saucepan and added some tomato paste (to thicken the soup), oregano, parsley, and basil. After a big stir over medium heat, that began simmering into a nice sauce. The frozen veggies went into the microwave. The bread went into a 350 degree oven for 13 minutes. The pasta water boiled, so in went the tortellini and cooked in a quick 5 minutes. By then the vegetables were cooked, and the bread was ready. As the pasta drained, I pulled the bread out of the oven, split and buttered the biscuits. The veggies went into an oven safe bowl with a little butter and parmesan cheese. I put it back in the microwave for a minute. Dinner was on the table in a snap. You can’t hit it out of the ballpark every night. It wasn’t a perfectly healthy dinner, but much more nutrient dense and economical than any drive thru meal. Not bad for a home made family meal tossed together in about 30 minutes. The best part, and you may use this if you like, is the “dinner rule” in my house. The person or people who make dinner don’t do the dishes or clean up the kitchen. At first this was a hot button issue with whining teenagers arguing their point of why they should not have to do the dishes. I turned a deaf ear to it, so the whining did not last long. But this rule, held tightly from the get go, changed the thinking in my household. Others wanted to cook dinner. And who am I to argue? I am a busy working mother. I understand what it is like to work all day and come home to hungry kids that need a good supper. It is tempting to go find a drive thru and just be done with it. But let’s state the obvious and say that the nutrition in a fast food meal just isn’t the same as a healthy home cooked meal. But how do we find the time and energy to cook a meal after a long day at work? I will tell you how! Anyone can have a nutritious dinner ready quickly. It takes a tiny bit of planning, so the next time you go to the grocery store get these items on hand. Then you will be ready to toss together a quick family dinner in less time than it would take to go out for fast food. Now let’s get cooking. When you walk in the door, turn the oven onto 350 degrees then go change into comfortable clothes. Ok, back to the kitchen. Place the chicken breasts on a baking sheet, salt and pepper them, and toss them in the oven. Wash the potatoes and pierce the skin with a fork twice. If you don’t prick the potato with a fork, it will explode when cooking. And believe me, you don’t want to clean THAT up! Place the potatoes like numbers on a clock or spokes on a wheel around a microwave safe plate. Put them in the microwave, and follow your manufacturers directions for cooking the baked potatoes. My microwave has a baked potato button to push, and it does the rest of the work for me! The potatoes, depending on the size, will take 15 minutes or so to cook. Rotate them once or twice during cooking. Set the table, or better yet, have the kids do it. The chicken will need about 25 minutes in the oven. After about 20 minutes, pull it out and douse the chicken in BBQ sauce. Toss it back in the oven for the flavors to cook for another 5-10 minutes. Check the potatoes. Place a fork into one to test for doneness. The potato should be soft. When they are done, cover the plate with tin foil and get the frozen vegetables out. Read the directions. The vegetables that I prefer cook in their own bag. Easy! Put the vegetables in the microwave and cook for the designated amount of time, probably 7 or so minutes. While those are cooking, pull out some butter, maybe sour cream too. Whatever you like on a baked potato, put on the table. Pull out your dinner and enjoy! Not only will you enjoy a nutritious home cooked meal, you can enjoy the socialization that naturally comes with cooking and sharing a meal. While you are cooking, hopefully folks are in the kitchen with you to chat with and share thoughts of the day. A quick meal is also a great example for the family. There are choices to fast food! And they can be very quick! Last thought: do not take this whole task on yourself. Have the kids help with the cooking, and the kids will also be on KP duty (kitchen patrol). They can do the dishes. Not only is it important to get a nutritious meal on the table, it is also critical for the rest of the family learn to pitch in and help. After dinner is also a great time for the children to make their sandwich and lunch for the following day!